*It felt good to walk outside all week. I usually get more steps in walking outside as well, so that makes it easier to get to my 10,000 steps by the end of the day. *Paul raked leaves and filled seven black garbage bags full of them. A nice city employee drove by and told Paul he would swing by later today and pick the leaves up for him. After raking leaves, Paul started his “fence and gate” project. He moved the fence and gate on the left side of the garage up about five or six feet to increase our backyard space. We don’t spend a whole lot of time in the front yard, but we spend a lot of time in our backyard, so we will use additional space back there. *Morning for me was spent inside getting things cleaned and put away in anticipation for our dinner party we are hosting tonight. *Around noon I went over and saw my friend Kellee in her home office, and visited for a while. I was going to run an errand up in Wallace, but decided that could wait another day. I stopped by the vet clinic to pick up something then over to sister Christy’s house to get some money to pay for some cat meds when we go to CDA tomorrow. *Cleaning house and food preparation was in full swing once I arrived back home. 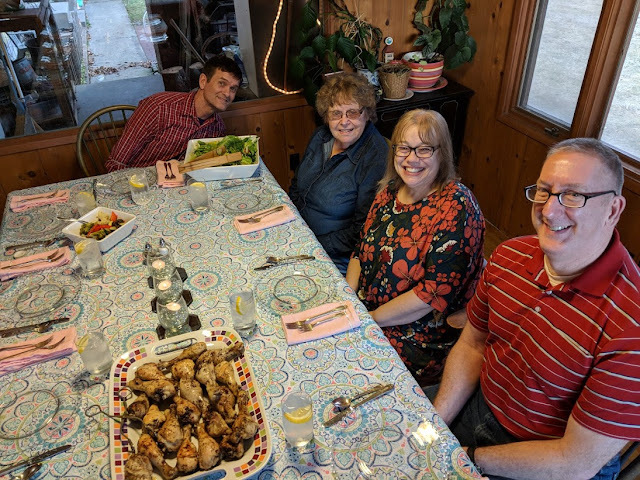 One of the members of our worship team at church, Joanne Montieth, is moving to CDA soon so we had a farewell dinner for her. I prepared baked chicken drumsticks, roasted vegetables and Greek salad. Godiva chocolates were for dessert. It was a wonderful time with Linda, David, Chris, Dan, Tim and Amy. What a blessing to have a group of loving people in your home to gather around the table and share and laugh and have fun together. A very special time honoring a very special lady. We will really miss Joanne!